Mix strawberries and bananas together for the sweetest treat summer has to offer. When it comes to dessert bread you really can’t go wrong with strawberry banana. I love how this bread comes out of the oven! Plus, while you are baking strawberry banana bread your house is being filled with the delicious scent of fruity goodness! I can’t even begin to describe to you how awesome this bread smells as it is baking. And get this…strawberry banana bread freezes up really well! You can bake multiple loaves and stash some in the freezer for later. Genius! Hop on over to the next page for the ingredients and instructions! 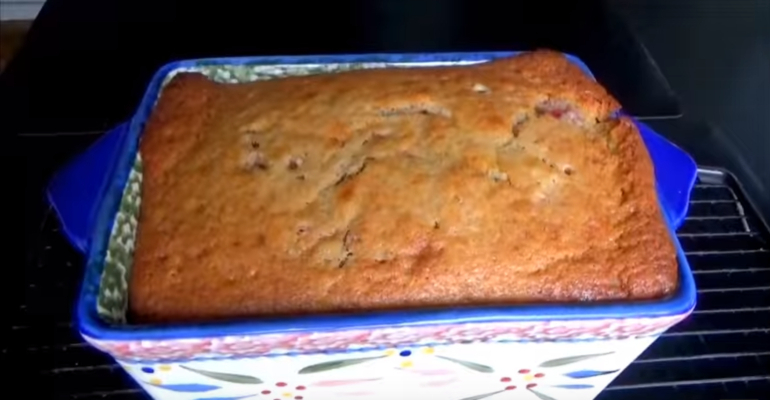 Thank you Let’s Bake something and YouTube for this wonderful strawberry banana bread recipe. USE THE RED NEXT PAGE LINK BELOW FOR THE STRAWBERRY BANANA BREAD RECIPE. Quick Tip: Strawberry banana bread makes the perfect treat for church potlucks, family gatherings, and even gift giving.